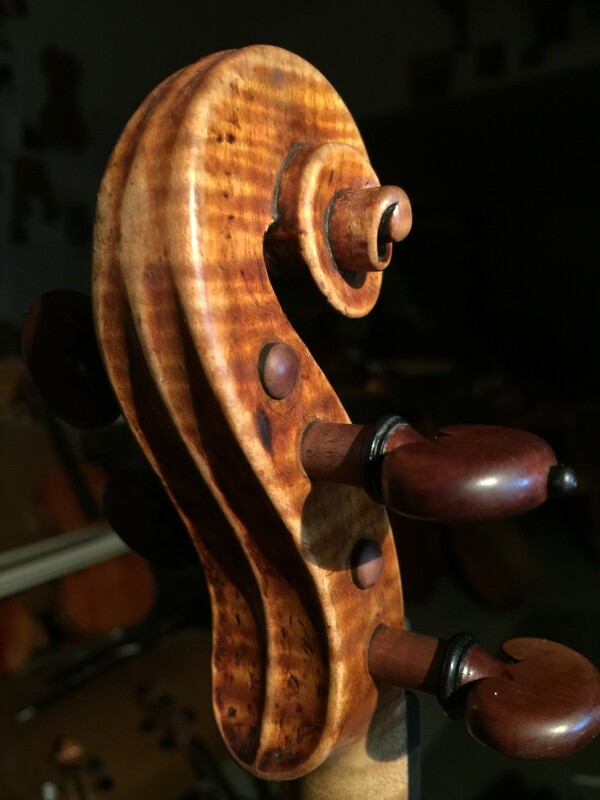 Very few things in my world are more beautiful than an Amati scroll…Crisp, living organic forms that are subtly transformed by centuries of wear…..sometimes I spend as much time admiring as working…. A talented player who studies with Jeff Solow at Temple had an accident with a cello that she had purchased from me a number of years ago. 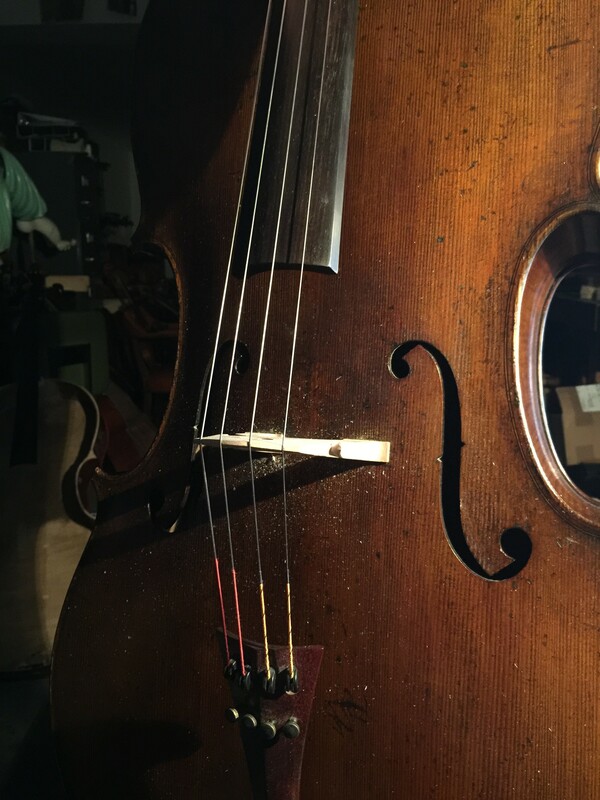 When the cello hit the ground the scroll sheared off …and the long ordeal of the cello neck graft was on. 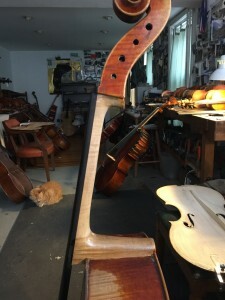 The first step is to remove the scroll from the neck and prepare it to accept the graft. The peg box is carved out at flat angles that will provide the maximum gluing surface to ensure a lasting bond. 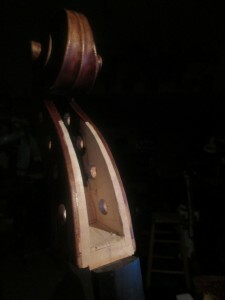 Next step is to fashion the graft out of similar flamed maple as the cello. 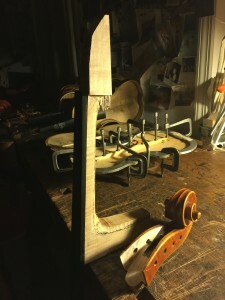 Using templates the neck is band sawed roughly then cleaned up by hand … with the upper part a series of angles corresponding to the prepared scroll. 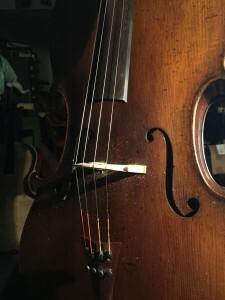 The scroll is then fit downward with some tension and the graft is carefully worked to let the scroll continue downward until its completely fits ( using a chalk transfer)on all surfaces at the desired spot right at the top edge of the fingerboard. Once glued the pegbox is carved out and the neck is roughly shaped and made ready to set into the corpus of the instrument. Andres Sanchez came to me about a year ago as he was readying himself to audition for Curtis. 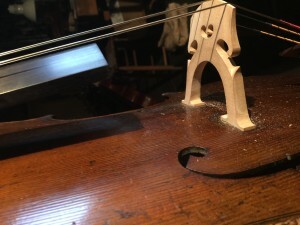 He wanted his cello to sound as good as possible…a big,round sound…..bold/warm/rich….i.e. 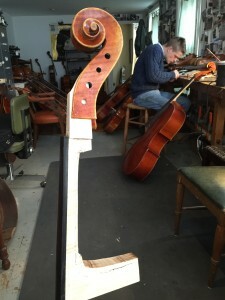 what every cellist wants…it all! It is a nice cello….but wasn’t particularly distinguished…I took the cello apart …changing the bass bar / raising the neck angle / new bridge & post…and anything else I could do to get the most and best out of his cello. 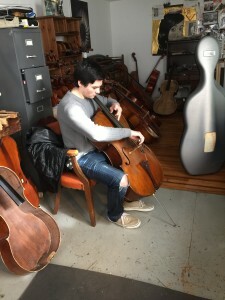 Well he was accepted to Curtis….and I certainly don’t want to say that his cellos sound had too much effect on that decision ….but the point I would like to stress is that many instruments are sounding OK ….but with the right drive and a little sense of daring …..things could be happening on a whole other level. It seems to me that life is way to short and players work way too hard to not be getting all the magic they can out of their instrument. In this visit he brought me the cello with the usual lower bridge due to winter weather… along with the wear and tear of a worn,rutted fingerboard due to countless hours of practice and open seams due to dry winter weather, touch up etc. ( with photos of the bridge in progress. Andres also mentioned the idea of making the new bridge on the high side to get even more power …. 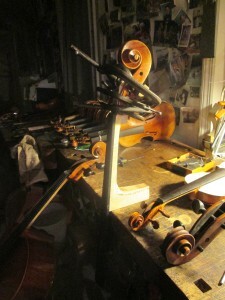 ( I’ve never met a serious cellist that thought more power wasn’t a great idea!). By cutting the bridge high you get more tension down on the top and hence more power – (along with a little more effort needed to play)…and of course the reaction was WOW!…..I think that one word sums up mission statement. I also appreciate his determination to pursue better and the willingness to take a chance – which is the soul of the artistic life. 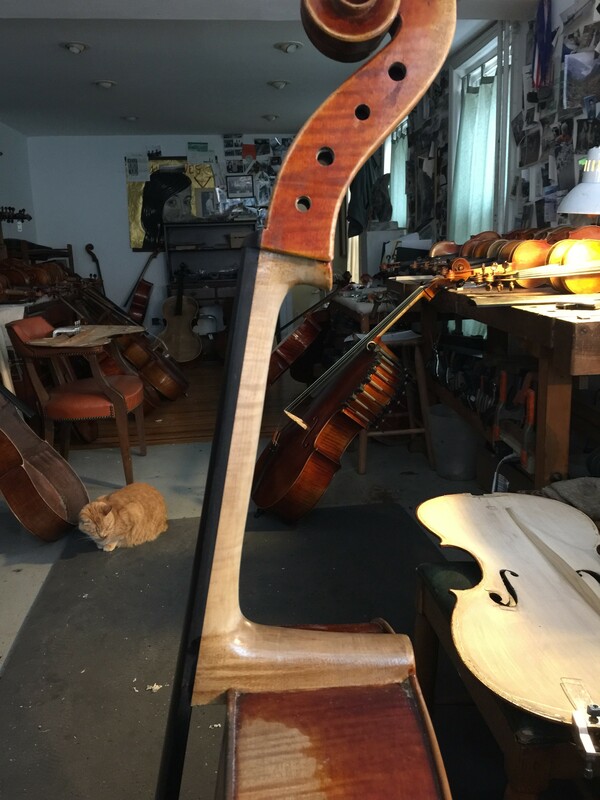 It is remarkable that Vuilluame’s instruments attain such a consistently high level given the number of different skilled hands are at work in his shop. The attention to detail in his work is both subtly exact and thoroughly artistic. This photo of the delicate bass f hole of a viola that passed through my hands shows this admirably. 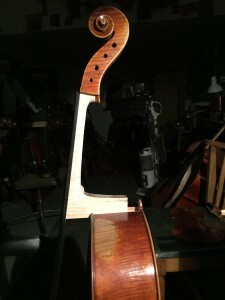 The way it flairs from the 2 soundholes and hits its widest at the notches before perfectly tapering toward the other soundhole is done with total command. 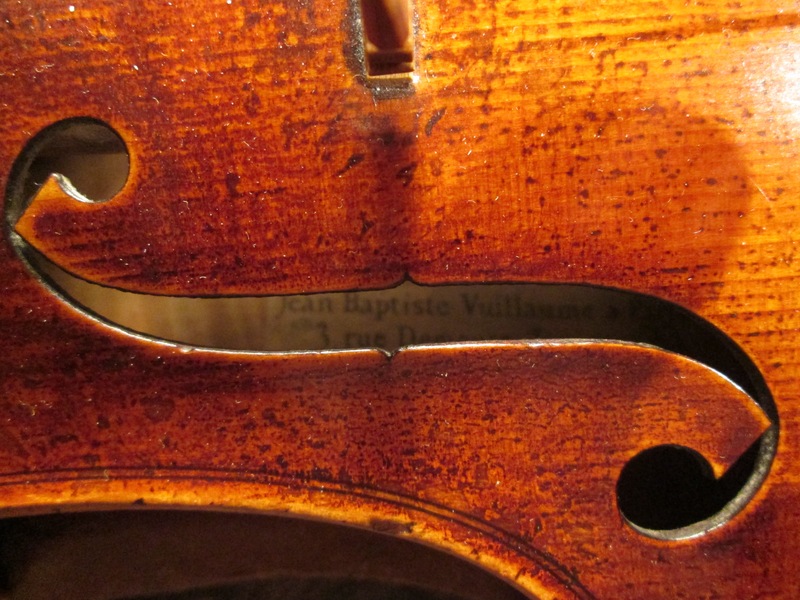 I also love the sculptural fluting of the outer edge of the f hole (lower,bottom edge in photo) Notice that the top flairs up from the purfling to the edge of the f hole to highlight the living,organic shape of the arching. Also to be enjoyed is a small taste of his handsome varnish….